SEE INDEX to Further Information at the Bottom of this Page. This means that the map or our concepts are NOT the territory or the reality, but just a representation of the territory or reality. EXAMPLE: Test scores show us how much a child understands or how much a child has learned. The “map," above, provides a view of some of the contexts that are involved in the problems facing teachers. Although this map is by no means complete, it may serve as an initial orientation to the complexity of the teaching profession. Keep in mind that the “problems” depicted on this map are not necessarily discrete and separate from one another. Rather, all of these problems interconnect and affect one another in a variety of ways. Please explore these dynamics here on this wiki. On the left side is a simplified representation of the hierarchy of schooling. Hierarchies in human society attempt to stabilize various organizations by solidifying relationships of power and control. However, the tendency is for such organizational schemes to produce dysfunctional relationships (e.g., competitive vying for control or dominant—submissive relationships). Hierarchies also tend to be rigid, rather than flexible, in their abilities to deal with issues and unforeseen events. Read further about layers, hierarchies, holarchies (embedded layers of organization where power and control is distributed and shared), and other metapatterns at Metapatterns -- The Pattern Underground. This hierarchy is represented again in the middle of the map as overlapping or embedded contexts. Surrounding these contexts are various types of problems. The “sphere” at the top left clusters together problems related to people and their relationships. The “sphere” at the top right contains problems that arise from our hierarchical organizations, including policies, laws, funding, and politics, in general. Problems of time and space, as more global categories, appear on the left, while the more global, conceptual problems of faulty or conflicting assumptions and philosophical or theoretical orientations appear on the right. The semicircular array of problems along the bottom represent some common types of problems. 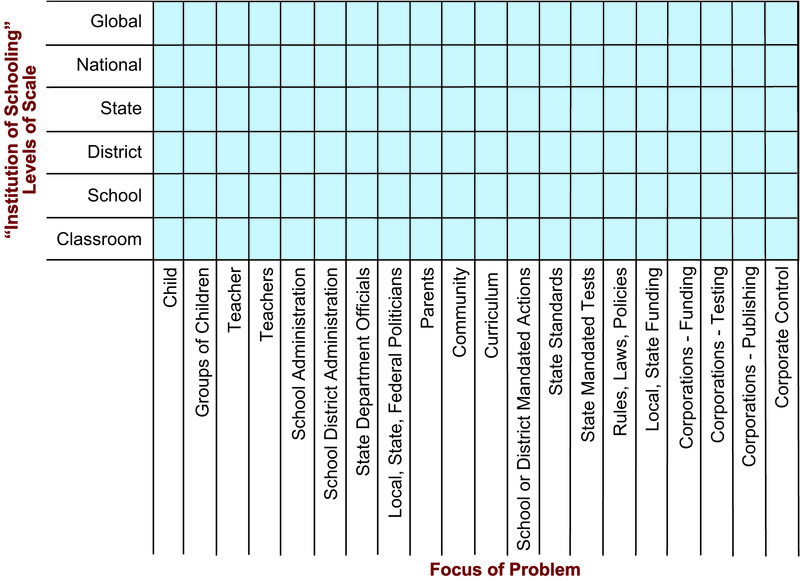 The Problem Grid below is another way of analyzing the problems we face as educators. The left side deals with the levels of scale of schooling as an institution. The items along the bottom are the foci of problems. You can add further items and extend this grid as necessary. As I look at this map I think that despite the fact that there are obvious factors leading into the State Department (society/community/people/culture) I wonder do those in power actually consider these issues when creating policies? How can one school with high tax payers have computers everywhere but a poorer district can't get enough computers in one lab? Can't the distribution of wealth be evened out? I guess not and that is why parents have become crafty in sending their students to other schools or districts. I understand why open enrollment is allowed but doesn't it defeat the purpose of neighborhood schools? I also think that even though School Districts or just individual schools have rules/regulations set in place, teachers are going to bring their own set of values, beliefs, anxieties and frustrations into the classroom climate; therefore creating their own culture and using their classroom as a place to maintain some sense of power (and even teaching to the test, following or not following school rules, posting grades, watching movies,etc). Of course these teachers cause good teachers to go bad, get angry and sometimes quit because sometimes alittle bit of power suffices the anger. I find this issue to be so relevant to what is going on in our educational system; balancing the distribution of wealth. I have been in schools where the computers are so old and slow the students are unable to utilize them efficiently, while other schools provide the latest equipment. How can students be motivated when their classrooms and materials are so run down? Every school district I have consulted in throughout the Phoenix, Mesa, Gilbert, Deer Valley, etc. area are run and maintained differently; this does not make sense to me. Every student as well as teachers should be allowed the same benefits, schools should be treated equally. Motivation in students as well as teachers is a problem in many school districts. If the teacher is not motivated, the students will not be motivated. These are extremely important issues you have brought up.